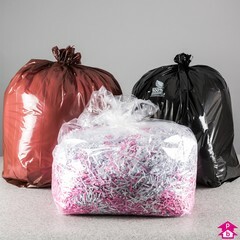 A fabulous 15% off our entire range of eco-friendly bin liners and refuse sacks ideal for landfill or compost disposal to reduce environmental impact. All of these bags degrade when buried or put in prolonged contact with soil. For our full range of environmentally-friendly packaging please visit our Eco Packaging section. 6 Products. 15% off our standard biodegradable bin liners, these composting bags and refuse sacks help you do your bit for the environment whilst still getting the job done. These bags biodegrade when put in prolonged contact with soil, making them perfect for composting or disposal in landfill. Available in a range of sizes, eco-friendly and simple to use. 5 Products. 15% off our PolyBio range of super environmentally-friendly starch-based bags. Ideal for kitchen, fruit, vegetable and garden waste. Made from corn starch (100% renewable and sustainable), the bags totally disintegrate into carbon dioxide, water and biomass within 10-12 weeks in standard composting condition - leaving zero harmful residue behind. 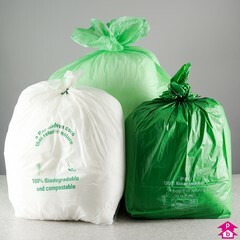 Bags are certified "OK COMPOST" by EU standard EN 13432 & International standard ASTM D6400-99.